Heart disease is usually describes as heart is not functioning well. 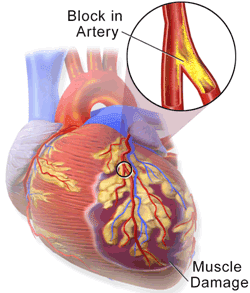 It is a condition of blockage in the arteries or the storage of plaques of fatty material on inner walls of arteries. This is also called as atherosclerosis. Heart disease is also called cardiovascular disease that included the heart, the blood vessels (arteries, capillaries, and veins) or both. Cardiovascular disease is the disease that affects the cardiovascular system. This disease is increasing rapidly worldwide. Some common symptoms of this disease are that blood pressure, heart failure, hypertension, chest pain, shortness of breathing, irregular heart beating and weakness. It is happens mainly because of cardiovascular functions are not working properly. It may be caused by lack of physical exercise, high cholesterol, obesity, diabetes, smoking, hereditary, excessive consumption of alcohol, stress, drug abuse, lack of healthy diet, lack of physical exercise and sedentary lifestyle. If you are in more trouble; it is necessary to consult your family doctor for proper diagnosis and treatment. You can also use some home remedies and change your lifestyle to get rid from heart diseases as well as escape from the risk of heart attack. Here are some effective home remedies for all types of heart diseases. You can try these remedies along with your regular treatment. Gooseberry (amla) has an excellent herbal fruit; it has natural antioxidant with rich source of vitamin C that helps to stimulate blood flow as well as eliminates all the obstacles in arteries. You can prepare this remedy for a month by this method. Take 100 gram fine powder of both dried amla (gooseberry) and sugar-candy. Mix properly and keep it into a plastic container. Take six grams (approx. a teaspoon) of this mixture with water on an empty stomach at daily morning. Use this remedy on a regular basis for at least 21 days to cure from all diseases related to your heart and blood. Garlic is not only a great kitchen ingredient but also an excellent herbal remedy. It is very effective for heart diseases. Allicin (an element of garlic) has blood thinning property that helps to control the cholesterol level. Consult your doctor before taking this remedy because of allicin property. Chew one or two fresh garlic cloves daily morning on an empty stomach. Repeat this treatment every day at least for a month to get beneficial. The botanical name of arjuna is terminalia arjuna. It has been used as Ayurvedic medicine since ancient time because it has excellent features to treat the heart diseases. Also it helps to cure from blood pressure and weakness. Mix 2 teaspoon of arjuna powder into a cup of milk. Then therein add 3 cups of water and bring to boil. Boil till it remains to one cup. Strain it and drink when it becomes lukewarm. You should drink this remedy in the morning on an empty stomach. It is best remedy to cure from heart disorders. Alternative: Take a teaspoon arjuna powder with water twice every day. Repeat it on a regular basis to completely cure from heart disease. Bottle gourd is a great herbal vegetable; it has the amazing ability to control the cholesterol level as well as obesity. It has many other elements that help to treat from heart diseases. You can try to prepare a simple but effective remedy as follows. Mix all these ingredients into a juicer blender to extract the juice. Normally it would be a cup of juice. Drink it in the morning on an empty stomach. It is best remedy to eliminate the entire blockage in the arteries of the heart. Caution: Do not use a gourd, which is bitter in taste. Exercise and healthy diet is the key to stay fit and healthy. If you want to get rid from cholesterol and obesity then do some physical practice every day. Exercise stimulates the blood flow and eliminates the blockage from arteries. Do remember exercise is most needed to a healthy life. So stay tuned and include some physical exercise and walking into your daily routine. 1. Eat papaya; it is beneficial in cardiovascular disease. 2. Avoid excess tea & coffee intake. 3. Avoid alcohol and quit smoking. 4. Do not eat fried, salty, fast & junk foods. 5. Do meditation and yoga for stay happy and stress free.